A personal touch may not have meant much to Marcy Heistand at first until the harsh realities of a tumor somewhere between her lungs and chest slapped her hard in the stomach. 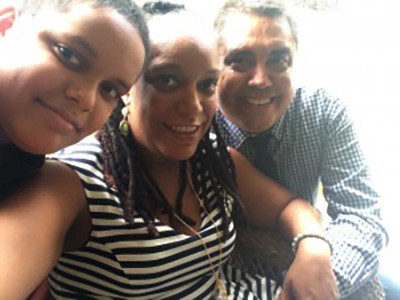 For sure she felt the uneasiness of her symptoms – shortness of breath, cough, and fatigue – but she wanted assurance in a decision only she and her family could make. Puerto Rico is banking that more Caribbean patients like Heistand — and those from larger markets in the mainland United States and elsewhere — will feel right at home in San Juan and make the island their destination of choice for medical tourism. 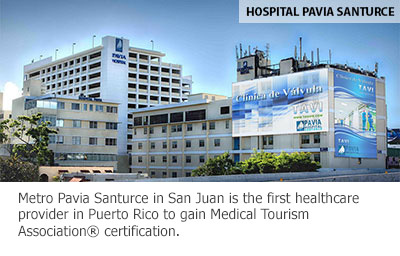 Hospital Pavia Santurce, part of the largest hospital network on the island, took great strides earlier this year to lay out the welcome mat for international patients when the executive, financial and administrative staff including customer service professionals completed training and certification processes offered by the Medical Tourism Association®. Alberto Bacó Bagué, Puerto Rico Secretary of Economic Development and Commerce, said International Patient Services Certification® positions the island to compete for international patients on a global scale. 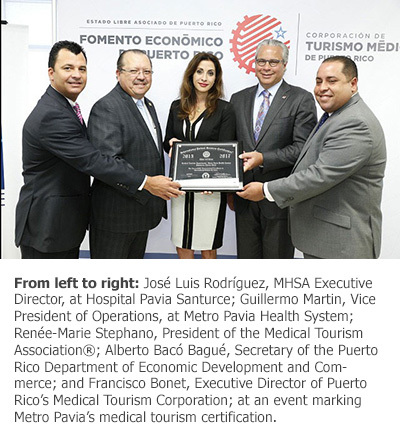 “We are convinced that our island will stand out in the area of certification due to the high measures were taken by our medical professionals, our hospital infrastructure and healthcare in general,” said Bacó, who also noted Puerto Rico had chosen Nueterra Global Alliance, a member of the Medical Tourism Association® and longtime sponsor of the World Medical Tourism & Global Healthcare Congress, Sept. 27-30, 2015, in Orlando, Fla., to serve as the island’s medical tourism facilitator for accessing international patients. “These two significant steps forward will strengthen our efforts to make medical tourism a real axis of economic development for the island,” he said. Metro Pavia, HIM San Pablo, and Ashford Presbyterian Community were among the healthcare affiliations that participated in the first round of training that, when finished, would certify some 35 hospitals to offer medical tourism services to foreign patients. Francisco G. Bonet, CEO for the Puerto Rico Medical Tourism Corporation, said certification validates that a healthcare provider can not only provide quality care for international patients but build valuable relationships with insurance companies and purchasers of health services that execute the process, as well. The Puerto Rico Medical Tourism Corporation, an arm of the commonwealth’s tourism structure, is in the midst of an aggressive campaign to market the island’s healthcare services to international patients. In the next three years, those efforts are hoped to create some 3,000 jobs and inject $300 million into the island’s economy. Renée-Marie Stephano, president of the Medical Tourism Association®, said beyond medical certification, 20 hotels and 100 professionals from related hospitality and travel sectors will participate in health tourism training on the island. She said the most recent endeavor that concluded last week in San Juan provided training for the Condado Plaza Hilton and Courtyard Marriott Miramar that will help to improve hotel operations and the management of medical tourism patient accommodations. Stephano said the Medical Tourism Association® will be in Puerto Rico again this week to participate in the “Caribbean Health Summit.” Representatives will be stressing the importance of maintaining top-rate service through training and certification along with a presentation from Jonathan Edelheit, CEO of the Medical Tourism Association®, on incorporating medical travel into a self-funded health plan. 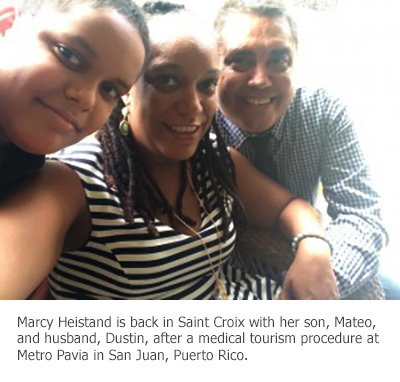 Marcy Heistand was happy to know her doctors in Puerto Rico were considering the highest precautions before they decided to remove the tumor from her thymus gland. The vice president for Seaborne Airlines was certainly familiar with flying back and forth to Puerto Rico but never before for surgery. The last thing she needed was an added headache. The best thing she got might have been a patient experience beyond her expectations. © 2017 Metro Pavía Health System.